Download a blank fillable Dd Form 2892 - Certificate Of Eligibility For Retired Members in PDF format just by clicking the "DOWNLOAD PDF" button. Complete Dd Form 2892 - Certificate Of Eligibility For Retired Members with your personal data - all interactive fields are highlighted in places where you should type, access drop-down lists or select multiple-choice options. within 30 days to ensure continued receipt of your retired pay. This form must be notarized. I CERTIFY THAT I AM ELIGIBLE TO CONTINUE RECEIVING RETIRED PAY. 7B and E.O. 9397 (SSN). 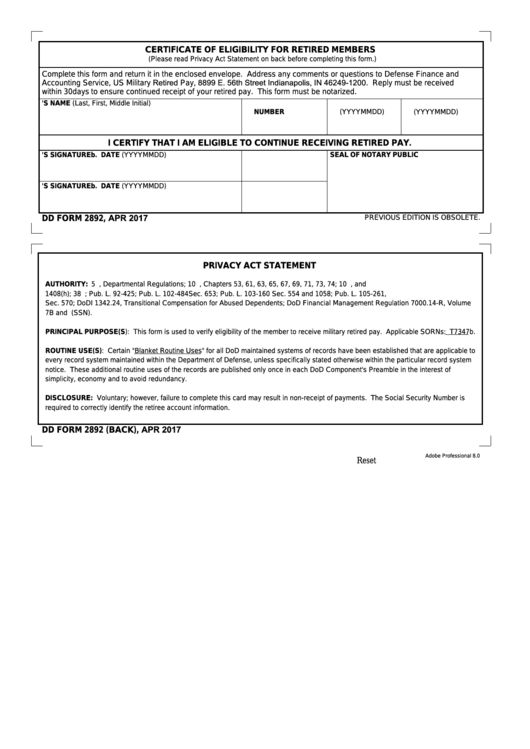 PRINCIPAL PURPOSE(S): This form is used to verify eligibility of the member to receive military retired pay. Applicable SORNs: T7347b. simplicity, economy and to avoid redundancy. required to correctly identify the retiree account information.